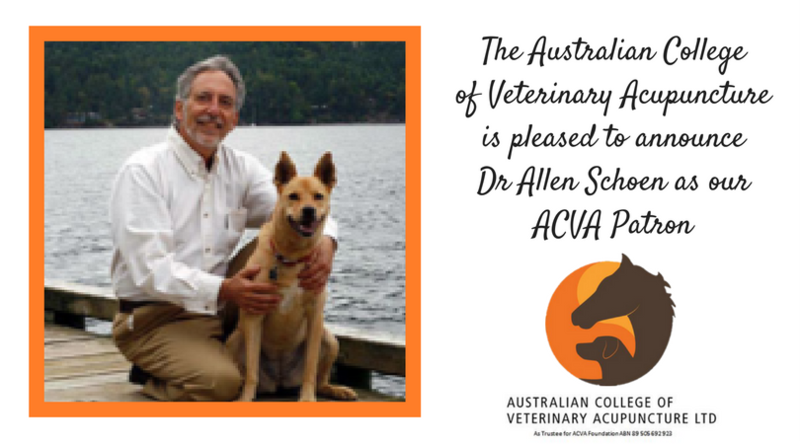 The ACVA Ltd is pleased to announce the appointment of internationally renowned and respected pioneer of complementary and alternative Veterinarian medicine. Below are some words from our patron showing the initiation of the Australian IVAS Course and the path travelled by Dr Schoen. As president of the International Veterinary Acupuncture Society (IVAS), I was originally invited to speak in Australia in 1989 to stimulate sufficient interest in having the first IVAS certification course in Australia. Dr’s Ulrike Wurth, Carl Muller and Christopher Robinson organized all my introductory lectures on the scientific basis and clinical applications of acupuncture. I lectured to veterinarians in Cairns, Brisbane, Sydney and Melbourne. These lectures did indeed stimulate enough interest for IVAS to have their first Australian acupuncture certification course and for the beginning of an Australian IVAS affiliate. I was then asked to be one of the speakers at the first IVAS course in 1991 and at subsequent IVAS courses. During my career, I was privileged as president, a teacher and guest lecturer, to assist in fulfilling the goals of IVAS of developing state of the art educational training programs of veterinary acupuncture throughout the world. I have always been interested in the links and bonds between the human and nonhuman animal species and in doing so have lectured and written about this subject for many years during which time these bonds have become more recognised and accepted in numerous ways. My books “Love, Miracles and Animal Healing” (Simon & Schuster, 1995), “Kindred Spirits, How The Remarkable Bond Between Humans and Animals Can Change the Way We Live” Broadway/Random House, 2001), and “The Compassionate Equestrian (Trafalgar Press, 2015) have opened up gateways for greater knowledge and understanding for veterinarians and their patients, especially when using veterinary acupuncture techniques and practice. I continue to be amazed at the depth of such bonds and how they affect the human and animal interaction. In 1990, I was asked to write about Acupuncture in “Problems in Veterinary Medicine” which was a quarterly publication and focused on one particular aspect of Veterinary Medicine in depth each quarter. I was then asked to edit one of the first textbooks on Veterinary Acupuncture, “Veterinary Acupuncture, Ancient Art to Modern Medicine” (Mosby, 1995 and 2001, 2nd edition) as well as co-edit “Complementary & Alternative Veterinary Medicine, Principles & Practice” (Mosby, 1998). These publications increased the acceptance of these complementary modalities in veterinary medicine. Learning acupuncture has been a life changing experience for me. Once I realised that there were more options, in addition to medicine and surgery, to help animals heal, my mind opened to more expansive views of reality and what is possible. Acupuncture was the gateway experience, that stimulated me to explore a vast new world of complementary therapies and the true meaning of healing. Acupuncture also created new career possibilities in veterinary medicine for me that did not previously exist. I was asked to create the first Department of Veterinary Acupuncture outside of Asia at the prestigious Animal Medical Center, in New York City, the largest animal hospital in the world at the time. There, interns and residents were able to witness for the first time, cases being successfully treated with acupuncture as an integral part of medicine and surgery. These veterinarians spread this exciting message throughout the world to the various veterinary schools and specialty centre’s where they worked after graduation and asked me to lecture at their conferences and schools. This greatly helped accelerate the spread and acceptance of veterinary acupuncture as an integral part of veterinary practice globally. I was then invited to be an Assistant Professor at Colorado State University College of Veterinary Medicine as well as at Tufts University School of Veterinary Medicine. All of these changes helped the profession to incorporate acupuncture into mainstream veterinary practice. In 2010, I was awarded the lifetime achievement award by the American Academy of Veterinary Acupuncture for my contributions to the advancement of veterinary acupuncture. In 2015, I was recognized as one of the fifteen most influential veterinarians by www.veterinarianedu.org for my contributions to the advancement of veterinary medicine. I am simply grateful to see that all these efforts allowed more veterinarians to help heal more animals. It is a joy to see so many of the IVAS graduates in Australia and the Asia Pacific Region prosper and spread the word on the benefits of veterinary acupuncture for animals and their human caretakers. I am grateful to see how acupuncture has blossomed in Australia and the Asia Pacific Region over the past 26 years. Thank you again for your continued contributions to veterinary acupuncture. The ACVA has created such a great college and professional acupuncture training courses that are of tremendous benefit to animals, their human caretakers and veterinarians throughout Australia and the Asia Pacific Region. I am grateful to be a part of this noble endeavour. As the patron of ACVA, I would like to be able to continue to support the growth of the Australian College of Veterinary Acupuncture in any way possible. We can create a healthier and happier world by working together to heal animals, heal ourselves and heal the global environment! Thank you for honoring me with being a Patron and thank you for inviting me to join all of you in creating a more harmonious world.